One strong arrival and one that was moderately encouraging. FOX: LA TO VEGAS landed at 1.1, up 0.4 from the last airing of BROOKLYN NINE-NINE. It was preceded by a LETHAL WEAPON (not a rerun, notwithstanding the chart) that was up 0.1 to 1.1 from its December 12 episode, and followed by an episode of THE MICK that was steady at 0.8 with its December 5 run. NBC: ELLEN’S GAME OF GAMES had a solid timeslot start at 2.2/2.4, up considerably from the last non-finale Tuesday episode of THE VOICE (1.7). CHICAGO MED had a 0.4 boost to 1.5. ABC: Compared to their last airings on December 12, THE MIDDLE rose 0.2 to 1.5, FRESH OFF THE BOAT gained 0.2 to 1.2, and BLACK-ISH was down 0.1 to 1.1. 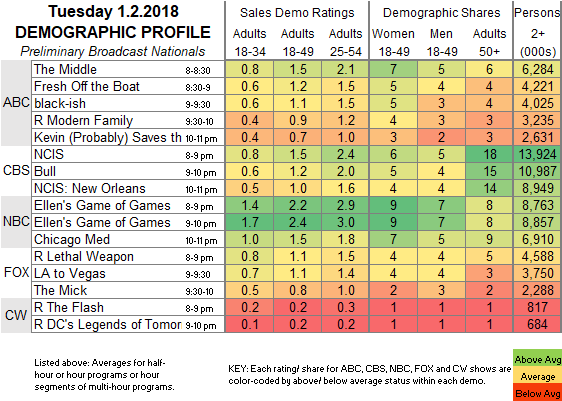 After a 0.9 MODERN FAMILY rerun, KEVIN (PROBABLY) SAVES THE WORLD ticked up to 0.7. 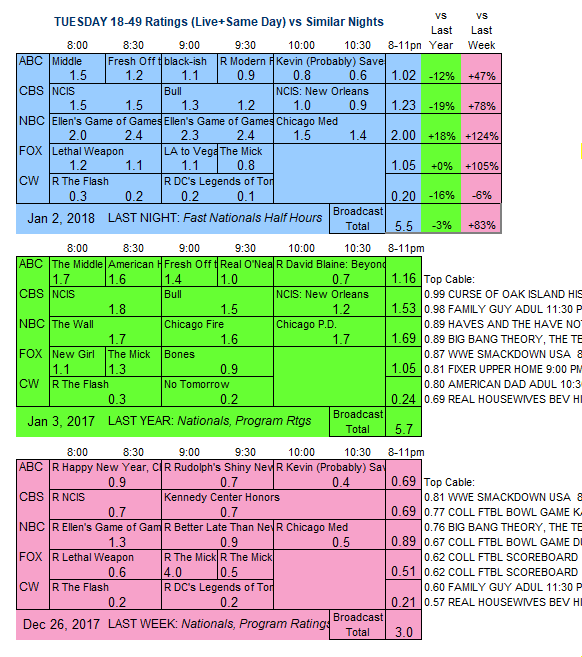 CBS: With comparisons again to December 12, NCIS was up 0.1 to 1.5, BULL dropped 0.1 to 1.2, and NCIS: NEW ORLEANS gained 0.1 to 1.0. Tonight, FOX introduces Ryan Murphy’s 9-1-1 tonight after the season premiere of THE X FILES. On cable, Freeform premieres its sister network’s spin-off GROWN-ISH with back-to-back episodes. CABLE RATINGS: Come back Thursday morning for detailed demographic ratings for top cable programs from this day, later than usual due to the New Year’s Day holiday.